Sim City was a huge PC hit, providing you with a blank landscape on which to build your own metropolis. The game propelled Will Wright and Maxis into stardom, and Nintendo secured the rights to develop the home console versions of the games in the early 90's. 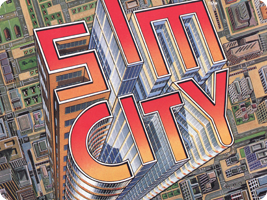 Sim City was owned by Maxis, and is now owned by Electronic Arts. Only Sim City games published by Nintendo will appear on this list.